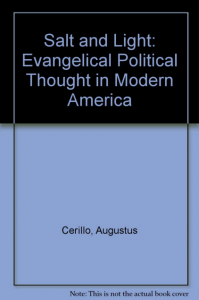 Author: Cerillo, Augustus Jr., Dempster, Murray W.
This is a compilation of debate articles between the religious political right and left beginning in the mid 1950’s and continuing through the 1980’s. Representative of the right are writers like Carl F.H. Henry, founding editor of Christianity Today, and Jerry Falwell, while the left is represented by such writers as Jim Wallis, founding editor of Sojourners. Understand that Jim Wallis, et. al., are not religious liberals; they are evangelicals who hold to inerrancy, sole fide, etc. It is their positon that a proper rendering of the holy scriptures results in a socially active agenda while proclaiming the gospel of salvation. These people are truly sold out to Christ to the point of radical activism which they believe is demanded by Scripture.